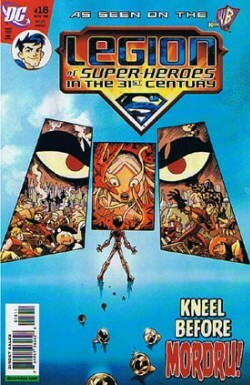 "Legion of Super Heroes in the 31st Century #18"
Superman Homepage writer Adam Dechanel caught up with "Legion of Super Heroes in the 31st Century" writer J. Torres to ask him about his latest, and final, story for the comic book series. 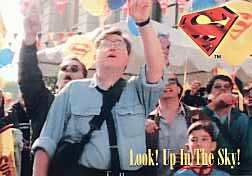 The Superman Homepage would like to thank J. Torres for agreeing to do this interview, and for fitting it into his busy schedule. Q: Did you know the book was ending when you wrote this issue? A: If I remember correctly at the time, about six months back, we were "on notice" that the series might end, but no one knew the number. I actually thought we'd at least get to #24 or #25. We were also working with a different editor at the time who was on her way out the door to work elsewhere. She had approved five of my plots by then, and we'd discussed other storylines, and even made some further plans, but we didn't know how far we'd get. It was a strange time of uncertainty and it kind of felt like being in limbo. Q: Something is going on with Brainiac isn't it, spill it! A: In season three, Brainy was supposed to return to the Legion. We decided we'd go with that plot element even if the show was canceled. I came up with a story where he becomes the new leader and makes some changes - some brilliant, some questionable, for example, like adding a fail safe to the flight rings. There was nothing sinister behind this, Brainy meant well, but you can imagine how some Legionnaires would react considering all the Brainiac 1.0 stuff. The plan when I wrote #17 was to have #18 and #19 tie in and form a bigger picture, an arc if you will, one that we would eventually connect up to the end of season two. When the show wasn't picked up for a third season, and with the inevitable end of the comic series looming, plus a new editor coming on board, plans abruptly changed. Originally, we were going to show where Brainy went after becoming "human," and how he ended up reverting to his old self and rejoining the Legion. Because of the timing of the show, when it aired and so on, our previous editor asked me to "skip" that story to be written and put into the line-up later, presumably before #17-19, when some scheduling and other planning had been figured out. Jack Briglio and I were going to co-write that story.�When that didn't happen we thought we might be able to do a "flashback" issue in the 20s. And then we found out the series was to end at #20, and a Metallo story Jack had written was still in inventory, so our new editor had to use that one in lieu of a new one that hadn't been written yet. Q: How do you feel about the book ending? Q: Did you have a plan for the direction the book was going? Q: Will this incarnation of the Legion ever be revisited? A: I've got one more issue of Legion coming out. I've also got two more issues of Family Dynamic to come. I don't have any other DC work lined up right now, but I'm told something should come my way eventually. Early next year, though, I'll be putting out a handful of new creator-owned projects including two graphic novels through Oni Press, one called "Lola: A Ghost Story" and another called "Dead Goombas," which is a zombie book. I've also been asked to work on some very cool properties at another company and I'm hoping to be able to elaborate on that soon!